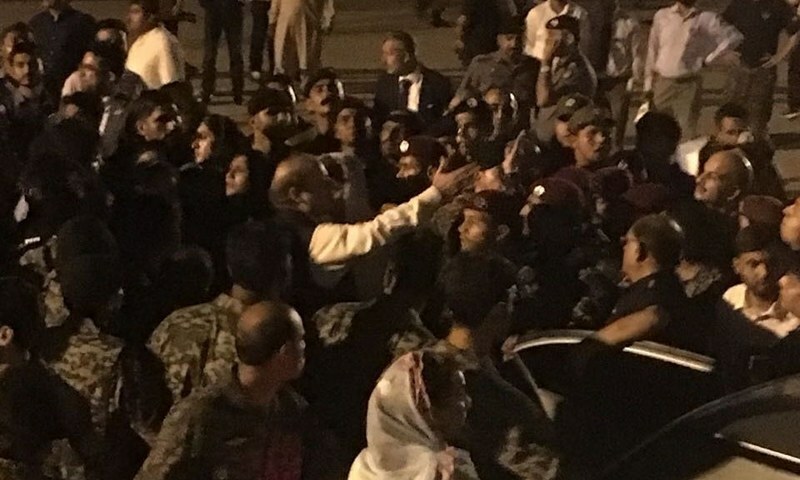 LAHORE/ISLAMABAD: Former prime minister Nawaz Sharif and his daughter Maryam Nawaz were jailed a couple of hours after a team of the National Accountability Bureau (NAB) formally arrested them at the Lahore airport on their arrival from the United Arab Emirates (UAE) on Friday night, as several thousand party supporters gathered on the streets of Lahore to ‘welcome’ their leaders. The convicted father-daughter duo landed in Lahore amid an impressive power show put up by the Pakistan Muslim League-Nawaz (PML-N), as thousands of workers and sympathisers reached the Mall Road by breaking through cordons amid an unwarranted police crackdown ordered by the interim provincial government. As soon as he landed in Lahore, the deposed prime minister and his daughter were taken to the Haj Terminal. After completing the immigration formalities, Nawaz and Maryam were put on a private jet and flown to Islamabad from where they were escorted to the Adiala Jail in Rawalpindi amidst tight security for medical examination. While Nawaz was moved to his cell in Adiala, Maryam was taken to the Sihala Rest House, which has been declared a sub-jail. The Sharifs, travelling to Lahore via Abu Dhabi from London, were supposed to reach Lahore around 6pm; however, their flight got postponed due to an unexpected three-hour delay. As reporters were not allowed to meet the Sharifs at the Abu Dhabi airport, Nawaz address them through a telephone, according to a BBC reporter, and said “the country’s fate need to be changed—we need to be harbinger of this change”. During the call, he wondered how a flight “that is never late” had been delayed and urged people to “think about who delayed this flight and why”. Commenting on the media blackout of the coverage of his party’s ‘welcome’ procession in Lahore, Nawaz said, “They are afraid that’s why they are doing this.” From several speeches of his and Maryam, it can be deduced by ‘they’ he meant the military establishment. He also interlinked the arrests of his party workers, media blackout, and a forced change of party leaders’ loyalties to ‘pre-poll rigging’. A defiant Nawaz told journalists that he was not afraid to go to jail and “it does not matter whether I am arrested from Abu Dhabi [where the NAB team had reached to arrest him] or Lahore”. “I am ready for it,” he said. An impressive show of power on the call of the party leadership, especially Nawaz’s younger brother Shehbaz Sharif and Maryam Nawaz, thousands of party workers poured onto the roads on Friday evening. The city had been facing a lockdown situation since Wednesday night, with entry and exit points of the city blocked and containers placed on various roads to prevent the PML-N zealots from reaching the airport. The caretaker government went a step further to scuttle the ‘welcome’ procession by jamming cellular networks and the internet – decisions that were severely criticized both by citizens and political leaders. However, the PML-N workers remained unfazed in the face of arrests, as the detention of hundreds of party workers on Friday too failed to discourage them from coming out on the streets. Shehbaz Sharif, who replaced his brother Nawaz as the new president of the PML-N, led a huge procession from Lohari Gate to accord a warm ‘welcome’ to his party’s supreme leader. Charged workers, travelling with Shehbaz, and in separate smaller groups chanted slogans in favour of the elder Sharif, ‘Dekho Dekho Koun Aya, Sher Aya Aya’ (Look who’s here…it’s the lion) and ‘Vote ko Izzat Do’ (honour the vote). A large police contingent, along with anti-riot personnel, failed to stop the PML-N workers from forcibly pushing aside the containers that had been placed on the Charing Cross Chowk (Faisal Chowk) on Mall Road to stop them from heading towards the airport. The crowd comprised women, though less in number, children and the elderly besides a majority of middle-aged men. However, the main procession led by Shehbaz Sharif failed to reach the airport in time for Nawaz’s flight despite his appeal to supporters to ‘move fast’. There were reports of sporadic clashes between the police and PML-N workers, however the processions remained largely peaceful most of the day. Police resorted to firing teargas to disperse the crowds, who responded by pelting bricks and stones. The clashes resulted in the arrest of at least a dozen people. A Special Branch official, on condition of anonymity, told Pakistan Today that the security measures taken by the caretaker government were “uncalled for”. “The PML-N workers could have been allowed to go to the airport where they could have been easily contained,” he said, adding that such measures only helped garnered sympathy for the party and its leader, Nawaz Sharif. Another official said they were not allowed to use force against the agitating PML-N workers.